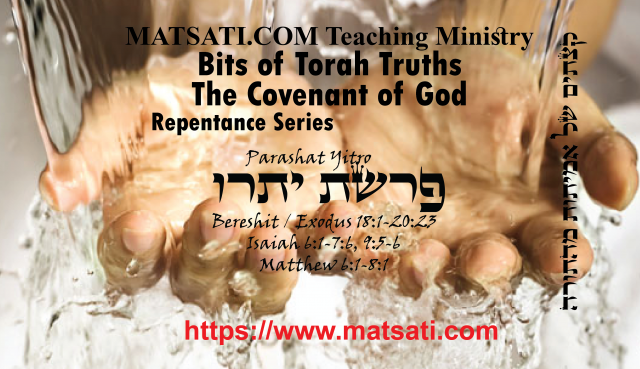 Bits of Torah Truths, פרשת יתרו, Parashat Yitro, Consecrating ourselves for His Glory! The reason that the portion of Yitro which contains the account of the giving of the Torah also follows the story of the fight against Amalek and Yitro’s conversion, is that the report of the giving of the Torah is a reminder that eventually the Torah will become the property of all of mankind and G’d’s name and knowledge of Him will be world-wide “like the waters which cover the ocean” (Isaiah 11,9). Following that redemption there will be a יום הדין, a “day of judgment,” a resurrection of the dead. This is why the portion ואלה המשפטים follows the giving of the Torah to signal to us that resurrection and eternal life will be for those who observe the commandments spelled out in that portion. It is worth noting that when Daniel 12,2 refers to that day in the future he mentions the word אלה twice in that verse. The proximity of our portions is to be understood in terms of Isaiah 46,10 מגיד מראשית אחרית “who foretells at the beginning what the end is going to be like.” By commencing פרשת משפטים with the word ואלה, the link between Torah legislation, observance and resurrection as mentioned in Daniel is established. Note how according to this commentary, the Torah portion is connected to the resurrection and the obedience to the commandments. This is consistent with what we read in the Apostolic Writings in the book of Revelation 19 (see also Jeremiah 31), Galatians 5, Romans 3:31, 7, 15, and 16, etc. Note how the rabbinic commentary mentions “the story of the fight against Amalek and Yitro’s conversion, is that the report of the giving of the Torah is a reminder that eventually the Torah will become the property of all of mankind and G’d’s name and knowledge of Him will be world-wide.” (see Isaiah 1 and 2) The point of Yitro hearing the report of Moshe, Israel, and the Lord God in heaven was to bring the Torah of God to all the earth. It is interesting how the fame of the God of Israel and Moshe had gone out into all the world, so much so, even Midean which was a considerable distance away (across the Arabian peninsula) heard of the power and might of our God. In a similar manner, the Apostle Paul wrote to the romans saying that their fame had also gone out into all the world. Note how the fame of the righteous works of the Romans had gone out into all the world. Paul speaks of the obedience of the faith (1:5) and thanks God because of their faith in the Messiah that was demonstrated by their faithfulness which has been proclaimed throughout the whole world (1:8). Paul speaks of their faith in Yeshua the Messiah (Christ) and then of his desire to come to Rome and preach the gospel message to them. Having heard of Yeshua and placing their faith in Him, what is the gospel message Paul is referring to having such a great desire to preach to them if they have already heard and believed in Yeshua? Could this be what the rabbinic commentary is relating to on the importance of the Torah for our lives when the rabbis say: “This is why the portion ואלה המשפטים follows the giving of the Torah to signal to us that resurrection and eternal life will be for those who observe the commandments spelled out in that portion. It is worth noting that when Daniel 12,2 refers to that day in the future he mentions the word אלה twice in that verse. The proximity of our portions is to be understood in terms of Isaiah 46,10 מגיד מראשית אחרית “who foretells at the beginning what the end is going to be like.” By commencing פרשת משפטים with the word ואלה, the link between Torah legislation, observance and resurrection as mentioned in Daniel is established.” The rabbis speak of a link between the Torah, obedience to the commands, and the resurrection. These things are connected because the mitzvot (commandments) are part of the sanctification process, of setting us apart as holy unto God for His glory and to bear His testimonies. Previous articleTehillim / Psalms 133, ספר תהילים קלג, Part 2, Understanding the Meaning and Nature of Unity!